Retail has evolved quickly in the ecommerce era. Take Amazon. It started as an online bookshop. Then it developed into a multi-products retailer with its own marketplace that others can sell on. And now the company is testing drone delivery, has a store where you don’t even have to use the tills and is pioneering a two-hour delivery model. Amazon is certainly spearheading change in retail. Its initiatives reflect the upturn in online buying. And the company has stimulated and driven a shift in consumer behaviour. But Amazon’s ascendancy belies the other face of retail in the UK: the challenging economic conditions; the demise of the high street; and the collapse of so many once-thriving retailers. So what’s next to come in the rapidly changing world of retail? 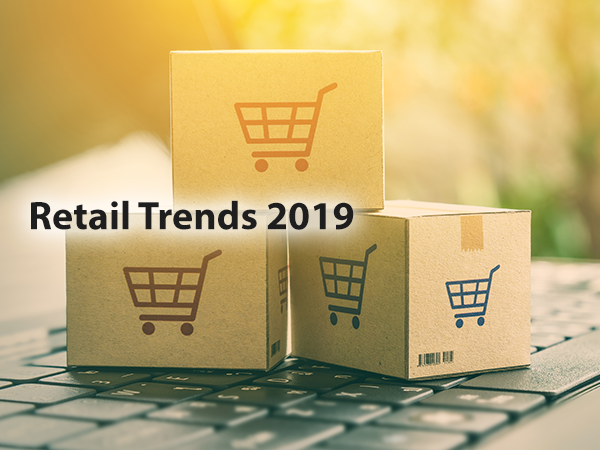 Here’s our thoughts on the retail trends for 2019. Millennials were recently more tightly defined as those having been born between 1981 and 1996. During 2019, these people will therefore be between 22 and 38 years old. This group of young adults is now reaching better market influence and increased buying power. Millennials tend to opt to purchase from companies that reflect their own values. They choose to shop with a conscience and their purchases make them feel good. They are loyal to companies that demonstrate corporate social responsibility behaviours that match their own beliefs. And their buying process has a greater emotional component than seen with Generation X and older. They also share their lives more prolifically on social media. And this includes telling their friends what they’ve bought and how they feel about it. In turn, this leads them to trust peer-created endorsements and reviews. They place greater emphasis on how their peers feel about goods and services, and show a greater distrust of adverts and brand-generated promotion. So, to meet the needs of the millennials and their growing influence, retailers will need to adapt. As a minimum, they will need to boost how they portray the ethical, environmental and social aspects of their businesses. But the more successful ones will be those whose businesses models are even more in tune with millennials’ fundamental attitudes. A chain coffee shop responsibly paying its taxes, using fairtrade practices and employing recyclable materials will appeal to many. But millennials are likely to select even more ethical businesses, like Change Please, where they can see that buying a coffee can have a direct effect on others’ lives. Last mile delivery continues to be a core focus in the retail sector. The retail sector is worth £395bn and around 18% of goods are bought online. So more than £70bn worth of goods are being delivered each year in the UK. And that is a figure which is growing all the time. Brands in the retail sector are having to pay greater attention to how they meet customers’ evolving expectations. Customers want their goods delivered quickly. Providing speedier delivery or alternative collection points will be what can help differentiate retailers. More may choose to offer same-day or next-day delivery. Or they may deploy multi-carrier management so that they can always provide the fastest service. Others may choose carriers that have an excellent network of collection points, so that customers can collect at a convenient time and from a local outlet. While the UK high street may be in decline, there’s still a demand for physical shops. Many people still like to feel the material that their new trousers are made from, and to see that their tomatoes are ripe enough. Amazon has pioneered a shopping model that allows this but which takes away some of the other barriers. Shopping in an Amazon Go store is fast- as there’s no need to queue and have goods scanned at a till. And for the retailer, it reduces staff costs and eliminates shoplifting. Other technology companies are already developing similar systems, and Amazon is reportedly looking for locations for its disruptive supermarkets in the UK. Another technology giant, Google, is driving a different kind of technology that will affect retail in 2019. Its Beacon platform and technology allow for proximity marketing. This can deliver a contextually relevant experience according to a user’s location. A retail app with Beacon technology can therefore identify precisely where one of a retailer’s customers is. It could flag up when they enter a store, or are nearby. Tailored offers can then be delivered to that user, with the aim of encouraging a visit to the store, or perhaps to inspire a purchase. This can really drive cross-selling, up-selling and customer loyalty. Beacons are even precise enough to map a consumer’s journey within a store. This has enormous possibilities for informing in-store marketing and promotion. Ever more prevalent use of artificial intelligence and machine-learning will help retailers to consolidate all that they know about their customers. This data will enable them to deliver the retail experience that their customers are seeking. Through enhanced customer-centricity, a uniquely personalised experience can be created for customers – wherever across the omni-channel spectrum they are shopping – and is vital for boosting income and profit. Businesses will need to refine the products the offer, and also ensure accurate stock levels to be able to meet the needs of customers. In turn, distributors will need sophisticated IT systems that will give them visibility and flexibility. They will need ERP systems with clever inventory planning and forecasting. They will need agile warehouse systems that manage their dynamic supply chains. And they’ll look for transport management and carrier systems that can handle their complex logistics. 5. Brexit – the demise of just in time? Of course, no “retail trends for 2019” article would be complete without a mention of Brexit. At the time of writing, it seems that we may getting near to having a deal before the end of March deadline. But if we don’t, then it may spell the end of the “just in time” (JIT) production and supply chains that we’ve become accustomed to in the UK. It’s currently easy to bring goods in from the EU at the last minute. Whether that’s to then deliver them direct to the supermarket shelves or to use them just as they are needed in the production line, it’s a practice that brings cost efficiencies. But it may no longer be possible after Brexit. If the UK is unable to strike a trade deal with the EU, then there will be additional friction in the supply chain. There may be hold ups at customs borders, increased bureaucracy, and delays due to new paperwork being completed and submitted. And, of course, there will be tariffs that will push up costs. Without an EU trade deal, retailers will need to move away from JIT and find a new way of importing. They may need to start to hold inventory, or hold more of it, or hold it for longer. This has already caused a rise in the demand for warehouse space in the UK. Late last year, demand for warehouse space was already said to have reached “fever pitch” and warehouse providers represented by the Food Storage and Distribution Federation (FSDF) are now apparently at capacity. As well as needing more physical space to store goods, the retail sector will have to ensure that their warehouse management practices are up to speed. With greater pressure on supply chains, inventory levels, picking practices and fulfilment methods will all be crucial to ensuring a continued smooth supply of goods to meet demand. Or call us on 020 8819 9071 or get in touch for a demonstration of any of our solutions.